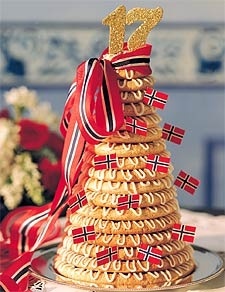 When Norwegians celebrate Constitution Day on May 17, several elements must be in place including Bunad, Norwegian flags, hotdogs, marching band music, and not least -Kransekake. Kransekake, this glory of almonds, powdered sugar and egg whites, which towers high above all the other cakes on the table has its origin in Norway and Denmark. It is usually served on special occasions such as baptisms, conformations, weddings and May 17. It takes the form of a series of concentric rings of cake put on top of each other forming a steep-sloped cone, often eighteen or more layers, glued together with white icing. The rings are made of almonds, powdered sugar, and egg whites, and the ideal Kransekake is hard when touching it, but soft on the inside. One cultural tradition is for a newly weeded couple to lift the top layer of the cake at their wedding. The number of rings that stick to the top ring is said to be the number of children the couple will be blessed with. You will find a Kransekake recipe here on BBC Food.